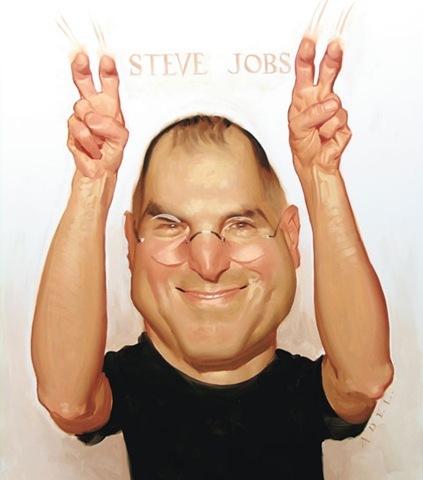 Update: Brian Chen from Wired writes of Steve Jobs’ “email campaign” with input from Steve Rubel and Brian Solis. My $0.02 per my original blog post below: I think a CEO “email campaign” (if true) sounds a tad manipulative and opportunistic. That said, a consistent Twitter outreach from a CEO seems a more authentic way to reach a far wider audience – and more effective. I can assure you a twitter.com/stevejobs account will rival that of Gizmodo‘s w/ 83K followers and offer an easier way for a CEO to reach fans and media alike. Beg to differ. Please comment away. And, Thanks for reading! If you like this content, follow me on Twitter! 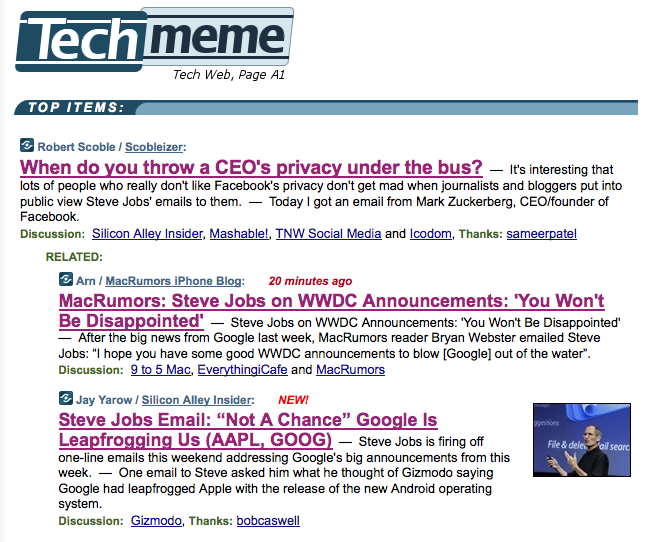 Turn on Techmeme yesterday and and this is what I saw. CEO emails were all the rage on TechMeme yesterday! This is not an isolated occurrence. I’ve been seeing a lot of emails coming from 1 Infinite Loop in the past 24 hours as well as preceding weeks. UPDATE: Zuckerberg gave me permission to print this email while I was typing this post. Cue Seinfeld tone: What’s… the deal… with CEOs and emails these days?! I constantly review CEOs and their attempts at blogging. I’d have to agree with Steve Jobs’ BFF Larry Ellison that there are far more important issues for a CEO to deal with than to regularly write blog posts. His exact words were, I quote: “Blogging was a silly diversion” for former Sun CEO Jonathan Schwartz. Zing. Yes, there’s always the one off crisis management blog post that I believe a CEO can deliver with much impact, but regular blogging is overkill. That said, since my last post on this topic, the landscape for corporate communication has been radically transformed thanks to Twitter and its ability to offer anybody (even CEOs) a chance to communicate to their audience (maybe peers, employees, customers or the media) in an authentic manner with a minimal investment of time. A twitter account is a perfect way to strike the right balance (I’ve said it before). Plus, for any CEO (especially, a celebrity like Steve Jobs) the sky is the limit when it comes to the following he can gather should he choose to tweet on a regular basis. I’m just saying, cos he’s been emailing a lot lately. With that in mind, I wrote down 5 questions for a CEO or executive to consider before choosing to start with social media. Print this out and share it with your CEO, in case of an emergency. And, is that on behalf of my company’s brand or my own. Most of the executives who blog have a great personality in front of the social media camera and are comfortable playing the role of a celebrity. But, if you’re camera shy and would rather just get the job done and move on (like HPs Mark Hurd), forget about it. Check out other executives who tweet. Is this something you’d be comfortable doing? Zappos’ CEO Tony Hsieh (1.6M followers). Topics: Pithy, inspirational quotes. Cisco’s CTO Padmasree (1.4M followers). Topics: Tech, music, weekends and lots of engagement with followers. Express’ CMO Lisa (17K followers). Style: Topics: Yes, she tweets often about Fashion. In many cases Express’. Formerly Kodak’s CMO Jeffrey Hayzlett (21K). Topics: Travel and book related. And, so many more. Yes, it’s pretty amazing. Also, do you know of any CEOs who have established a presence on Facebook to engage with their “fans”? Sorry. Former Governor Sarah Palin doesn’t count. 2. Does this tie into your branding strategy? What surprised me most about Steve Jobs’ late night emails (there’s a part of me that still wants to believe it is fake) is that it contradicts the carefully constructed image we have of Apple and by association Steve Jobs. It paints him more Howard Hughes than PT Barnum. Every brand needs to continue that brand imagery on Twitter as well. In Express Retail’s case, they have an integrated marketing and branding strategy where they aggressively promote their Twitter and Facebook avatars through their packaging, etc. If you consider Twitter a marketing channel, then go all out and try to tie it into the larger marketing / branding efforts of the org. 3. Does this tie in with your communications strategy? Let’s not forget all of the above CEO emails were with bloggers and journalists. Mostly bloggers. The fact is most bloggers (and increasingly journalists) are on Twitter, plus your conversations are going to be broadcast to millions of other users in addition, making your communication more effective than an email. Plus, you can always DM (private message) a journalist if you want to say: “No“. Check out a list of bloggers and journalists who are on Twitter already. 4. Have you considered the legal ramifications? Understand that blogs and Twitter fall under the FTC’s guidelines, so beware of frivolous brand endorsements. And, don’t forget the SEC since that could be a bigger problem for you especially if you’re a publicly traded company. Here are some of the issues they watch out for (Source: BNET). clarification of how the anti-fraud provisions apply to statements made by the company (or by a person acting on behalf of the company) in blogs and electronic shareholder forums. If you’ve answered all the above questions with a “Yes”, then take the tiny little step of actually setting up your Twitter account (which should take all of 2 minutes). And, send out your first “Hello World” tweet for the world to see. Yes, it may seem intimidating now, but the ramifications of a positive engaging conversation with your customers has a positive impact to your brand. But all of this is valid ONLY if you’re truly interested in having this as an ongoing conversation. With Twitter it’s a small yet considerable investment of your valuable time, so think twice before you jump in. Because if you quit doing it, you’ll be worse off than if you never started twittering. An easier way, would be to establish a presence on LinkedIn. (Disclosure: Yes, I work there). If you’re interested in these topics, please subscribe to my blog. And, don’t be a stranger. Leave a comment, rant, rave or tweet me @mariosundar. great article! took a lot from it especially the 5 questions. Thanks, JR! Which company do you work for? What a writeup!! Very informative and easy to understand. Looking for more such blog posts!! Do you have a twitter or a facebook?